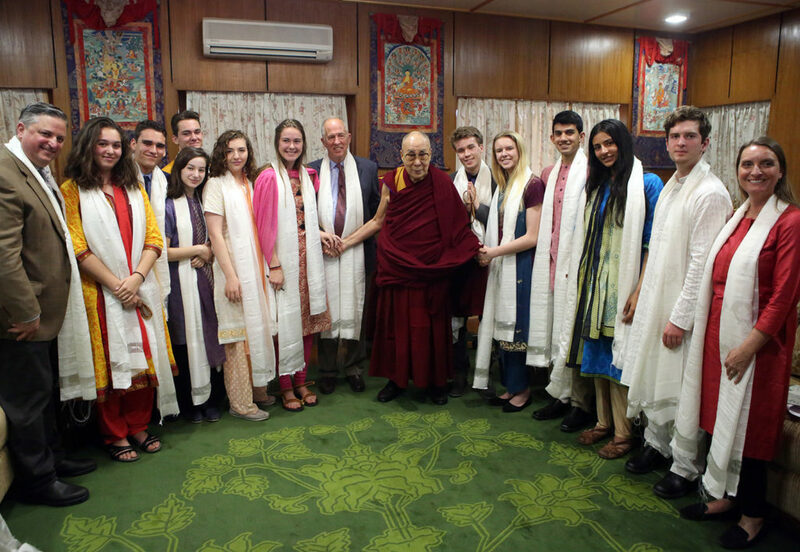 Today we had the once in a life time opportunity to interview His Holiness the Dalai Lama. Luckily, the days leading up to this have been packed with enjoyable shopping, eating, and traveling, which left no time, until the evening before, to begin stressing about this huge milestone in our lives. The first part of the day, before the interview, was filled with last minute preparations. However, no amount of preparing could steady my nerves. When arriving at the His Holiness’ compound, we saw where the monks live, train, and study scripture. Something that really grabbed my attention was the way the monks practiced their way of debating. I had no idea what they were saying but seeing their movements and constant clapping, filled me with curiosity. We set up the camera gear in a waiting room, just two rooms down from one of the greatest spiritual leaders of all time. After the setup was finished, everyone was guided onto a porch right outside of the interview room. While waiting, I caught a glimpse of a very familiar face in a window. 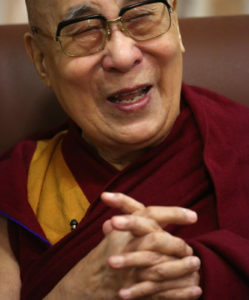 I saw a Tibetan monk smiling and laughing as he conversed with his guests. My smile was much faster than my brain in realizing who I was watching through the window. All the stress that was weighing on my body lifted, and I stood and reflected on the accomplishments of the man our class was about to interview. As his previous guests left the room, we were led by the staff to the door where we were greeted by the smiling face of His Holiness. 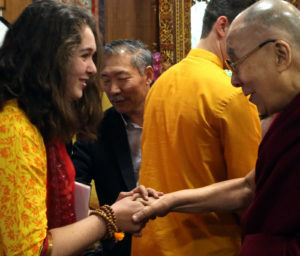 The fact that someone so crucial to leading our world down a proper spiritual path was using his free time to meet with us was quite heartwarming, and very emotional for me. As he shook my hand, I finally realized that I was not completely dreaming. In response to our questions, His Holiness was quite humorous and very mischievous; he kept sticking out his tongue when answering questions. One main point he kept bringing up was how flawed the education system is throughout the world, and how we need to add curriculum focused on learning how to control the mind and free it from the emotion of anger and other negative responses. This struck me because I realized how many problems in the world could be solved if anger was controlled. At the end of the interview, everyone was sad to see him go. One question that remained unanswered for our whole class was, what divine intervention gave us the luck to meet such a joyous man? Seeing the Dalai Lama was unlike anything I have ever experienced, and most likely anything I will ever experience in the future. Even with everything that we had heard beforehand, and with all the preparation and research we did, there was no way for any of us to be ready to meet him. He had an audience before he met with us, so we had to wait in the hall next to the interview room, where we could see and hear him faintly, which made everyone’s nerves reach an all-time high. When he finished his previous audience, we all filed in and he greeted us one by one. He is by far one of the most, if not the most, respected people the world, so the entire experience was very surreal. When it was my turn to greet him, he took my hand with both of his, and laughed, which immediately grounded me in the moment and helped me to feel more at ease. Of course, I was still extremely nervous to ask my question. I could ask it because I knew that it wouldn’t matter if I messed up, or stumbled over the question, he wouldn’t think any less of me because he is so understanding and kind. 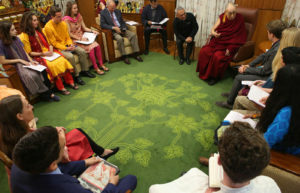 Something that His Holiness said that surprised me was that he thinks that people should question, investigate, and experiment with Buddhist teachings. It didn’t surprise me because I thought that he wouldn’t be open to that sort of idea; I was surprised because I didn’t expect a spiritual leader to encourage his students to question what he teaches. With little exposure to Buddhism, and religion in general, I am used to some spiritual and religious leaders branding those who don’t follow their teachings as heretics. Overall, this experience was very refreshing and enlightening, and a gift to be able to share with my classmates, close friends, and mentors. For our first interview of the day, we didn’t have to go far. The Dalai Lama’s compound was only a short walk from the top of the hill, that our hotel sits on. I only started to realize the gravity, and the reality, of our situation after we made it all the way through the inner gates, the public courtyard, and security. Even then, it was hard to imagine what would happen next. 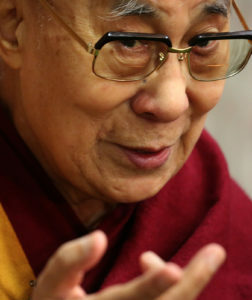 For a while we sat in the hallway, outside the meeting room, and caught glimpses of His Holiness through the glass. By this point, you could sense that everyone was very excited. This feeling was encouraged by the kind smiles of some of the other monks. 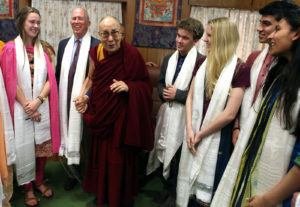 When His Holiness was ready to meet with us, we rolled our three cameras into the room, and he stepped up to greet each of us with a handshake and a smile. After our initial greeting, we sat down with little idea of what to expect. We knew that we had been told that we would get to ask around five questions, and we had our book to give him, but we also knew that this was probably one of the most popular and busiest men in the world. Although I was initially nervous, his demeanor and charm immediately put me at ease. He spoke clearly, and was easy to listen to. This helped make it easier to take in the knowledge he shared with us. Although I didn’t have the privilege of asking my question, many of the questions that were asked were ones with subjects that I felt a personal connection to. I remember a specific theme, and a few moments where His Holiness mentioned the state of the school systems of the world. He repeatedly mentioned the negative effects of the modern education system. He spoke about the lack of emotional teachings in schools, and how this had detrimental effects on mental health. Another thing that I felt was of current, and personal significance, was the emphasis he placed on acting against global warming. For me, his discussion about these ideas was meaningful in a few ways. Seeing his perspectives, and the positive way in which he phrased and spoke about these issues, gave me hope. He always seemed to be laughing, and even more often he would stick out his tongue before he was about to smile. Seeing someone of that caliber, of such importance and intelligence, speak about these sometimes seemingly impossible to solve issues, was inspiring. The positivity that he maintained, and the laughter he brought to the room, is probably what I will remember most.